The last day at Key West was a little different. We had absolutely no plans, except to get out in the sun for a while, but this time we opted to go to the beach, which was just across the street from where we were staying, a five minute or so walk. You might wonder why we didn’t go to the beach until the last day, or even why we waited until day four to get out in the sun, and the reason is quite simple: we went to Key West to see Key West, not get a tan. We also thought the temperatures would be too cool to lie in the sun, and neither of us are sun bunnies, anyway. We were at the beach by right around 11 and stayed about an hour. After getting cleaned up we headed out to nowhere in particular. Well, actually, we did have a destination, which was a tapas place called Santiago’s Bodega, which was highly recommended. It’s downtown two blocks off Duval where so many neat places are, but parking is such a problem in some areas, and we finally decided to go back to a place on the beach that had its own parking lot that we passed earlier, a decent little Italian deli called Saluté Ristorante. The atmosphere was terrific, with the dining area open to the beach, and the lunch menu provided some nice choices. Diane had a Media Noce sandwich similar to a Cuban Mix, but without the salami, which she said was good. I had an Italian sausage on a bun with peppers, onions and marinara sauce that was great. The wine and the atmosphere made the meal a delight. We drove back into town and found a free spot on US 1, which we had done before, but we were a few blocks further away than before. We visited a few shops, a great place called Glass Reunion that had a wide variety of nifty things, including kaleidoscopes, sculptures and more than I can remember. We stopped by a place called Mangoes and sipped some Cuban concoctions, and kept wandering around and decided to hit Sunset Pier again around five p.m., hoping to hear those two guitarists from Wednesday. As fate would have it, only one of them was there, and he told me that the other guy was really the Wednesday fill-in for the guy who was there that day, a soul singer who was pretty good. Honestly, the two guitarists were way better. We listened to the music for a while, and then headed down the waterfront to Mallory Square. On Wednesday on a trip to the bathroom I had heard two guys playing Latin music outside a Cuban restaurant, one a conga player and the other who sang and played a little flute now and then. When we went by that restaurant on Friday, guess what? The missing guitarist was there with those two guys and they were playing some blazing Latin tunes. The conga player turned out to be pretty good, so I tried to get some pointers. He turned out to be a schmuck (the schmuck is shown at right in the photo). 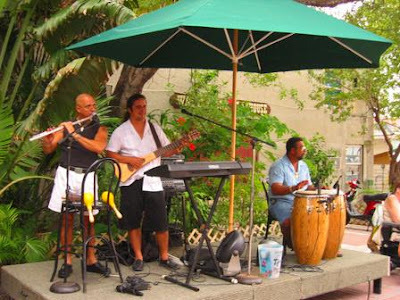 So, we dined on Cuban fare at El Meson de Pepe’s and enjoyed their music. Diane had the barbecued ribs special and I had the mixed seafood, both of which were accompanied with yellow rice, black beans, and fried plantain. All in all, a very good meal with very good music to go along, and as good a way to end a great week that I can think of.